A documentary about the true situation of Filipinos during the Marcos regime by the late Philippine Senator Jose W. Diokno. The late Senator narrated a documentary where it reveals the true situation of the Philippine economy during the Marcos dictatorship. As the founding chairman of the Commission on Human Rights, he exposes thousands of abuses committed by the Military under the Marcos regime. Even ordinary people in rural villages were being murdered and massacred to show the people that nobody could do protest or conduct activities against the government. 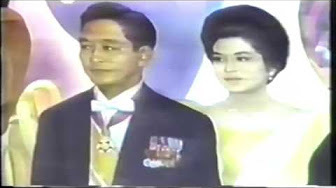 It also shows how the former First lady Imelda Marcos and the National Housing Authority manipulates the Filipinos on receiving housing benefits from the Marcos government. The narrative documentary also reveals how Marcos hides the true situation of the government health programs by building state of the art urban health facilities while rural areas are being deprived of proper health care. The documentary ends with a strong message from the late senator who still believes that Filipinos can still get out from this sad situation by fighting for our freedom so we would be able to sing our own song again.